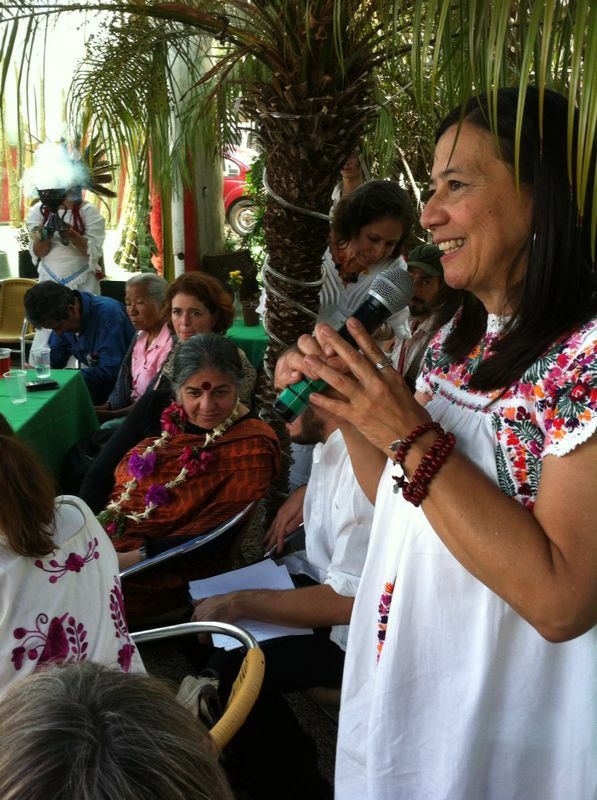 Adelita San Vicente Tello speaking at local celebration of Mexico's first National Holiday of Native and Creole Seeds. Photo courtesy of Adelita San Vicente Tello. Mexicans celebrated National Day of Maize yesterday, September 29, 2014, with demonstrations, marches, and expositions. Known as the Land of Maize, Mexico now imports one-third of this sacred icon and staple food, mostly from the US. A fierce battle is being waged over corn that is still grown in Mexico, with small farmers and seed sovereignty activists pitted against Monsanto and other GMO giants, the Mexican government, the US government, and the World Trade Organization. Adelita San Vicente Tello is an agronomist with a master's degree in rural development and a doctorate in agroecology. She is director of Seeds of Life (Semillas de Vida), a group promoting agro-biodiversity and protecting native corn. San Vicente is also a convener of the Mexico-wide food sovereignty coalition Without Corn, There Is No Country (Sin Maíz, No Hay País) and a member of the Union of Scientists Committed to Society (Unión de Científicos Comprometidos con la Sociedad). Here we have an opportunity, which is that most corn is still produced by campesinos/as [small farmers]. They still use native seeds, and they use rainwater for sowing - even though they do it in soil that is very degraded and thus produces little. We consider this small-holder production to be an opportunity, because genetic reserves are stored in the native seeds. Traditional knowledge lies within them. This is really where the alternative lies for the food production model, especially when faced with the problem of climate change. I work with an organization called Seeds of Life, which has an office in Mexico City but works throughout the country in Veracruz, Puebla, Jalisco, and Morelos. One thing we do is support the farmers in preserving their seeds by creating corn reserves. We call them reserves so as not to call them "banks", the capitalist term. As the campesinos/as say, the best way to preserve seeds is to plant them in the earth. We also share information on the risks of the dominant food system, specifically GMOs, in order to elevate health and ecological awareness among consumers. Seed exchanges are done at the regional level. Sometimes there is money exchanged in transactions between campesinos/as, but usually it's a free exchange of native seeds. They always have a blessing of the seeds, a ritual combining traditions from the Christian religion and the indigenous religion, the latter of which is based on agricultural cycles. The greed of transnational GMO and biofuel corporations has led to a dispute over corn. They want to rob all our global communities of this sacred grain. Since the 1990s, the Mexican government has been waging an agrocide, trying to kill the countryside and its campesinos/as. Mexico has suffered grave consequences from the import model. In the 20 years since the North American Free Trade Agreement [NAFTA, signed between Mexico, Canada, and the US in 1994] was passed, 20% of the population has become hungry, 70% has become underweight, and more than 6 million citizens have emigrated. We import 42% of the food we eat. Then, on January 1, 2008, matters got worse when the government completely opened up trade relations with the US and Canada, dropping remaining tariffs on basic foodstuffs of corn, beans, milk, and sugar. For these reasons, in 2007 we decided to create a campaign in Mexico called Without Corn, There Is No Country. We've tried to weave together many different efforts into this network. We did this to draw the attention of the Mexican government to our food crisis, and to get them to understand the political importance of food. What we want is for the Mexican government to protect our native seeds, to give financial support to help their preservation, and to have the international institutions recognize this resource. Our motto is "Put Mexico in your Mouth." We say: "Save the farms in order to save Mexico." We did so many things in this effort throughout 2007: we planted corn all over the city and sent out a call to others to sow corn seeds. We held a huge open-air market with farmers' produce at the Zocalo, the central plaza in Mexico City. We held a large concert with young people, and organized a fast for food independence on the anniversaries of the beginning of independence and the revolution. On midnight of January 1, 2008, farmers from Chihuahua symbolically closed down part of the border and we held a huge demonstration in Mexico City. We handed in almost 500,000 signatures to Congress demanding the right to food sovereignty. We presented forums and workshops, which gave us a national platform for very clear demands. Our central one was "Campesino/na foods for Mexico." What has been the government's response? They continue to support Monsanto, Cargill, and other large transnational corporations. With the support of the government, Cargill built ethanol-producing plants in Mexico. So now Mexico imports corn, and uses its own corn and land to produce biofuels. In 2009, the government gave the first permissions to experimentally plant GMO corn. In 2011, they gave out permissions to grow in a so-called pilot phase. Even though the government hasn't listened to us, we continued in our campaign. Since 2009 we've taken justice into our own hands. We carried out legal actions and large direct actions in defense of corn. We invited the UN Special Rapporteur on the Right to Food to come visit. We delivered a letter to Obama on his visit to Mexico asking for a renegotiation of the Agricultural chapter of NAFTA. We began celebrating National Day of Corn. We got the right to food enshrined in the constitution in 2011. We - including campesino/as organizations - kept bringing legal complaints against the government all the way to 2013, including a constitutional controversy with Municipality of Tepoztlan. But they always ruled against us in the courts. Finally, we filed a class action lawsuit against GMO corn on July 5, 2013. The group of plaintiffs included 53 people, among them experts in the field, prominent personalities, and celebrities; 20 organizations of producers, indigenous peoples, beekeepers, environmentalists, and consumers; and one human rights group. The lawsuit asked the court to declare the limits and restrictions established in the Biosecurity of Genetically Modified Organisms Law [LBOGM by its Spanish acronym] insufficient because there is scientific evidence of transgenic contamination of native corn in the states of Oaxaca, Sinaloa, Chihuahua, Veracruz, and Guanajuato. The inadequacy of the legal restrictions established in the LBOGM has infringed on many human rights, including the rights to a healthy environment; to preservation of biodiversity; to fair participation by the population; to a sustainable use of the biological diversity of native corn that will guarantee its access to future generations; to adequate, nutritious, and sufficient food; to cultural rights; and to health. Along with the lawsuit, the petitioners requested a precautionary measure, requesting that GMO corn not be allowed within the country's borders until the class action lawsuit has been definitively settled. [A judge"s ruling banning GMO corn came last October.] There have been more than 70 legal challenges from the companies and the government. The Without Corn, There Is No Country campaign has gotten stronger. More organizations are joining together to struggle against mass dispossession of lands, dispossession caused by the government prioritizing land use for extraction of petroleum and shale gas over food production. The defense of corn is not just to preserve our sacred plant. It is also fundamental to sustaining Mexico as a living genetic reserve of important varieties of fruits and vegetables that feed humanity. This great agro-biodiversity would never exist without the campesinos/as who, over centuries, have fed and nurtured a proud culture which is an example for many countries. When all is said and done, we are children of corn. It's our life, and we need to protect it. Adapted from Adelita San Vicente Tello's presentation to the Justice Begins with Seeds conference in Oakland in May, 2012, and updated in Mexico City in September, 2014. Translated and edited by Beverly Bell.